Needles to say, pasta is a true Italian original. We Japanese love pasta, and there is a surprisingly large amount of Italian restaurants in Japan. Today, I would like to introduce the recipe for “spaghetti Napolitain”. Spaghetti is of course a kind of pasta, but it may be hard to call this item purely “Italian”. This is Japanese style spaghetti. Formerly, there were many Japanese style western food restaurants. Just after western recipes arrived in the old days, people were slow in getting used to genuine western food. Sometimes it was difficult to find western ingredients. So, Japanese chefs adjusted the recipes to take advantage of the ingredients available, and to please the Japanese palate. 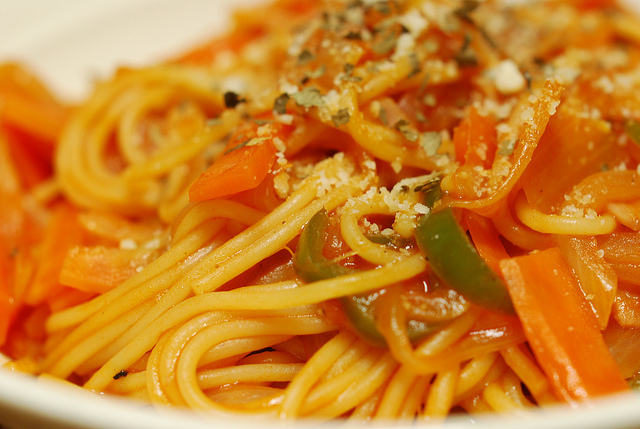 Spaghetti Napolitain is a masterpiece and reminds people of good old Japan (^^). Let’s take a look at the video of “Cooking With Dog”. *Pork Lion Ham>> can be any kind of ham. *Adding just a little bit of soy source makes it more Japanese! What makes this dish more Japanese style is the use of ketchup instead of tomato sauce. I guess it’s easy to get the ingredients for today’s recipe, even outside of Japan. Please do give it a try and turn your thoughts toward “good old Japan” (^^).